We are counted among the most distinguished organizations engaged in manufacturing, exporting and wholesaling a comprehensive assortment of Water Repellent Fabric. Made using quality-approved yarns and basic fabrics, these repellent fabrics are available in multitude of prints and colors as per the requirements of our clients. A.K.Industrial Fabrics offer a wide range of Water Repellent Fabrics. Our fabric treatments protect canvas from Weather Extremes, Tropical Rains, Moulds, Rotting, Ultra Violet, Tropical Rains. Our Water Repellent Fabrics are highly praised for their good finish and flawless quality. 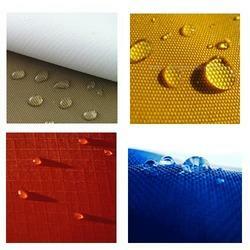 Clients can obtain these Water Repellent Fabrics at most economical prices.